Deo left violence and bloodshed behind him which is described in enough detail in this book as to make your stomach churn a bit. It is no wonder that Deo himself suffers from a nervous stomach much of his life! In this book we see how he arrived in New York City only to live homeless in Central Park. We track with him as he learns English and ultimately applies for Columbia University Medical School. His is really a rather amazing story and a curious one to hear. Deogratias is a man to be admired if hard work and determination mean anything. The first half of the book flips back and forth between Deo's previous life in, and escape from, Burundi and his ensuing life in America. Author Tracy Kidder gives you a good sense of the fear and uncertainty Deo must have faced in coming to a foreign country. Then, too, he makes you to rejoice when Deo leaps almost insurmountable hurdles to find his place in his new world. 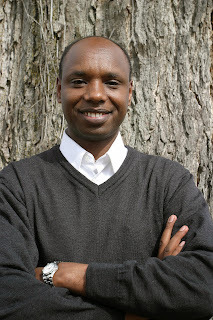 We the readers grapple with Deo's thought processes as he deals with the both the differences between Burundi and American cultures and also the unique and horrifying reality of his past. In the second half of the book we "meet" Tracy Kidder who introduces himself through his aquiaintanship with Deo. We know then that this story of Deo's life has been pieced together by Kidder as they have conversed with one another and spent time in each other's company. Kidder describes his observations about Deo as well as those of Burundi when the two men travel back together. With Kidder and Deo we retrace Deo's steps as he tried to escape from the bloody, war-torn Burundi of the mid-1990's. We also hear of Deo's plans to build a medical clinic in Burundi for the people. Certainly Strength in What Remains is not an easy book to read. I have to confess that I was not excited about it to begin with but found it interesting enough that I devoured the first half in a single reading. Despite my reservations about what I might find in the story, I was drawn in to the tale of Deo and I wandered what has become of him since the writing of the book. True confession time: I enjoyed the first half of the book more than the second half. The first is an interesting observation on what an immigrant might face when first coming to America. It is also a good study on how America differs from third world countries and it makes me consider how much we have "by right" here that people in other nations can't even begin to imagine. With few exceptions, we Americans have several changes of clothes, shoes on our feet and food in our bellies. I (once again) began thinking about the possessions I own and how so little is really required to feel perfectly satisfied. We Americans forget this, in our abundance of riches. I enjoyed the second half of the book less simply because it came across more as Kidder trying to prove the facts of Deo's story. While I agree that this is something that needed and had to be done (as dates and incidents can't be proven completely) it read off more like research than a story, and my interest waned a bit. It would seem that Strength in What Remains has received quite a bit of positive press since it's release in 2010. I found this interviewed with Deogratias (Deo) online that is sort of interesting to read. I couldn't resist looking up some pictures of the landscape of Burundi. This is one of them. Isn't it beautiful?!! 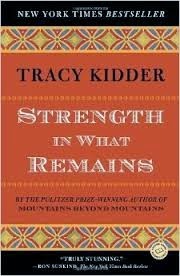 Strength in What Remains is not a book I would have picked up on my own but is one that I'm glad I was "forced" to read. This book proves the point of why it's great to be part of a book club because it will have you reading books that you wouldn't normally choose for yourself but might benefit from all the same. This is definitely a unique story and one that is likely to stick with me for some time. Have you seen the movie The Good Lie? This sounds similar. The movie is wonderful, though not for young kids. I had never heard of Deo or this book before reading your review. Sounds very interesting! Apparently, there's still a great deal of political unrest and persecution in Burundi. I heard a woman on the BBC news (I think, it was NPR anyway) yesterday who has fled Burundi to live in Rwanda. She has no legal status or means of income the than charity in Rwanda, but she can't return to Burundi because the government there wants to put her in jail for being a part of the political opposition. We do take much for granted here in the U.S., including our political and speech freedoms.